A new competition TV show from ABC will see people compete to get an all-new toy made by Mattel! Think of it like Shark Tank, but for pitching only new toy ideas. The winning design will be awarded $10,000 and will be made by Mattel! They are looking for contestants to appear on The Toy Box, which debuts on April 7th. ABC and Mattel are discovering the next great toy inventor on an all-new competition show! 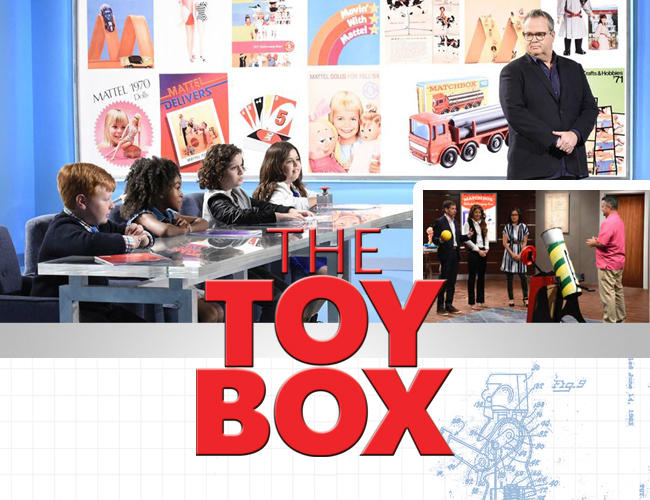 Tune in to The Toy Box when it premieres on April 7th at 8/7c! In this new show hosted by Modern Family star Eric Stonestreet, contestants will compete to have their toy made and brought to market by one of the world’s greatest toy companies! Each episode will have a set of amateur inventors run their designs through various trials, aiming for a spot in the finale in which they’ll pitch their inventions to a panel of kid judges. You can read the full press release here. YOU COULD WIN THE OPPORTUNITY TO HAVE YOUR TOY INVENTION MADE BY MATTEL & WIN UP TO $100,000! Selected contestants will have the chance to compete to have their toy made and brought to market by one of the world’s greatest toy companies! MysticArt Pictures is now accepting submissions for 2017. Click Login to Apply to complete your application and release for Toy Box! If you have what it takes and an idea to share, then you can apply by Clicking Here. I'm curious about the show, but with the storied success of many a KS venture, even a grand prize of $100K seems to fall a little short. Four Horsemen ended their latest campaign with essentially half a mil, if I'm not mistaken...Mattel may want to up the ante on this venture that seems more like a bid to infuse the company with new ideas and talent. I wouldn't be surprised, if win or lose, Mattel had contestants sign over patents. Cool, this might be fun to check out! Well, many of these won't have that same level of professional background and plus those KS and GFM ventures are more direct targeted while this is has wider audiences. And those projects are also doing the testing on their own dime, whereas this will be footing the bill for those regulations testing. Different markets too with different kind of restrictions since this will be major retailers as opposed to the direct sales of internet marketing that may not have some of those same restrictions. They also gotta see how the profit margins go for the first year, so they know profit projections for following years in how much room they have to increase prizes. So if the show does well, and whatever toys come out of it at mattel, and if they do well, you could see an increase in the show to attract more contestants. I didn't mean to sound like I wasn't interested. I like the idea and will tune in, I just think the cash amounts are a bit meager (and who am I? - not a toy-making exec, that's for sure). However, maybe my perspective is too skewed toward an action figure line. A reimagining of the Frisbee or Pet-Rock (being flippant, of course ), wouldn't cost as much to develop. As I said, I'll definitely be tuning in to see how things turn out...and like you, I hope it does well. Removed a ton of off-topic and needlessly argumentative posts.